Well, well, well! Milestones will be passed. You and I have been together here now for just over 4 years. Hell! That's longer than my entire academic career! * And there are so many of you. Unimaginably big numbers of you, which is what I'd have said if you'd told me on October 5, 2011 that today, this address on the web would've been accessed more than 480,000 times. You've been wonderful. And, despite my spotty presence in the past who-knows-how-long? it's been incredibly rewarding. Enough shilly-shallying! Down to business. 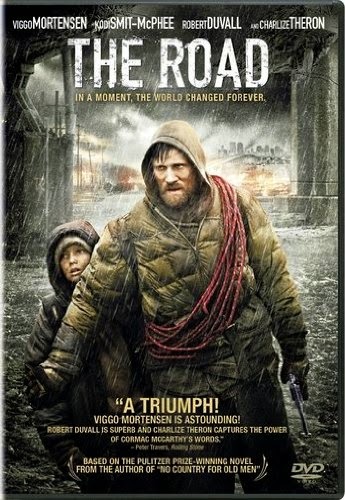 Perhaps you read The Road, by Cormac McCarthy. I did. Or, maybe you saw the film with Viggo Mortensen. I saw it too. Both left me filling bilious. Like most, you may have seen the narrative as a treatment of the human condition through a father and son story, played out in circumstances where even Hope seemed a cruel joke, and in which they have little to live with, or for, but their own [broken] bodies and [overburdened or innocent] minds. The end was more a welcome relief than anything close to uplifting. But we beat on . . .
And why should this concern an archaeologist? Funny you should ask! This archaeologist can't help being human. Can't forbear emotion. Can't escape the search for meaning in his own and in humanity's existence. [Even if the answer is, as I know it to be, "There is none!"]. And most of all, I have a burning need to understand phenomena that pique my interest. For me, it's rocks and bones that reached their sell-by date hundreds of thousands of years ago. I think that's why The Road fascinated me, even as it frustrated and bemused me. Why? Because all of the metaphors that the story evoked were, for me, trite—even hackneyed. Kinda like all of the ways that Paleolithic archaeologists have found to see human [read: yours and mine] cognition in Lower—or if you prefer the less denigrating—Early and Middle Paleolithic stone artifacts [and the bitumen, putative birch tar, putative purposeful burial, putative mammoth-bone structures, putative cooked pumpkin, putative this, putative that—the list grows by the hour]. I really don't give a poop about what Cormac McCarthy intended. I'm really only interested in what he wrote, and how, evidently, it revealed more about his cosmology and those of his reviewers than any of them could have imagined. Sorta like the rock and bone specialists whose 'scholarship' I've had the privilege to pillory these past four years. Something really bad happened in The Road. The world as we know it ended. And suddenly it was cold and lawless. Raw. Primal. [Hey! I could write those 15 second teasers for gook like this!] We aren't told what, exactly, happened. But, presumably it was nuclear Armageddon. Evidently there wasn't anything left alive. Leastwise, not worth eating. And, for some reason, two remnants of humanity—father and son [mum checked out, leaving her only begotten son, because she was too weak of spirit—try that on, if you have a feminist bone in your body]—are on a road trip [sorry, that's too deprecatory] a Quest for something better, or the meaning of life, or . . . you're the consumer/critic . . . you decide. Are we told what the two are questing for? Barely. Warmer climes. Seems pretty small potatoes to me. I can see the paraphrase quoted in frosted letters on Borders Books store windows in some future time: "'Tis better to die on a ghastly warm, tropical beach than to live in this ghastly, cold place!" Theirs is a road to nowhere—or to Hope, which is in my parlance, pretty much the same thing. But what does McCarthy think the road is. Why call your opus magnum The Road, if you didn't mean it to be a truly epochal place to spend time? So what does Dad figure is the best way to get where he's taking his son? Yep. The Road. Dad makes the two of them into walking road-kill. The Road! Can you say, exposed? Hell! They spend more time getting off the road, looking for leftovers in abandoned bomb shelters [that's what it was, folks, a 50s bomb shelter replete with Spam and Tang!, or high-tailing it trying to get away from the cannibals! But that road is a constant. I guess that's supposed to be a good thing. We'll see. And here's where I and Cormac McCarthy's conscious, or un-, come face to face. For me, one of the crucial moments in the book is when Father and Son come upon some of their fellow travellers—well, dead people—“half mired in the blacktop, clutching themselves, mouths howling”—frozen in time in what was, at some time in the recent past, molten asphalt. Skeletons. Um. Is it just me? This is the road that's supposed to be our salvation? Is it just a coincidence, or perhaps it's his unconscious talking, that the author decides shortly thereafter to end the journey for Dad and begin it for Son? McCarthy has told us [I can see him standing there, with his arms akimbo, laughing at us schmucks who've endured his crushing narrative to this point] that this road is and always was a road to oblivion. Could he have given us this image without intending us to see this? I doubt it. On the other hand, schlock fiction hasn't always scintillated for its ability to maintain verisimilitude longer than a nanosecond. God. Damn. It! McCarthy wasn't showing us a Father with a primordial urge to make his life better for his Son: he gave us a vision of what it's like when those in control cleave mindlessly to a way of life that is a) pointless, and b) dangerous to life on earth. That way of life, of course, is symbolized by the road—a perilous petrochemical pathway to prosperity until the global grab for fossil fuels led us down a swirling toilet bowl of increasingly violent and destructive wars until finally the world's people propelled themselves into a world-ending cataclysm. And the Road is supposed to have been a good idea? A symbol of the search for identity or humanity or salvation? Give me a break! Critics and pundits, heal thineselves! So. Paleolithic archaeologists, hold on to your brown fedoras, because this soulless critic of bad literary criticism and even worse archaeological narrative is on your case. I'm gonna dissect your arguments and their silly premises until there's nothing left but a graveyard of broken hypotheses, preserved, not in amber, but asphalt . . . or birch tar . . . or limestone breccia. I'd be hittin' the road, if I were you.